Plot summaries of Hirokazu Koreeda’s Still Walking are invariably misleading. By nature a plot summary implies that the narrative it sums up has a skeletal, reductive plot arc, and that every other technical or narrative element serves to further the plot’s impetus. Many films accommodate such an Aristotelian form, but Still Walking is not one of them. Rather than plot, Koreeda’s quiet film is about characters and relationships. It is not even a character study, but an observation of complex relationships. Despite being ultimately constructed and fictional, the film mirrors as closely as a subjective construction can an objective observation of a family dynamic. Unlike more traditional narratives, it does not accommodate quick categorization of characters. None of these family members can be succinctly summarized any more than the film as a whole can. No member of this family an be encapsulated in a single scene, rather the complexity and weight of the entire family’s history and imperfect communication becomes more apparent with each passing scene. Passing judgment on any character becomes difficult and rather irrelevant. Brecht declared that Realism was determined by how, when, and for what class a narrative was made. 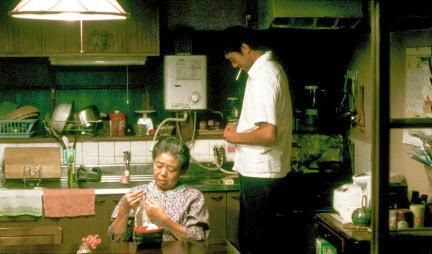 Koreeda is said to have made this film to voice his sentiments after the death of his mother. Such an exploration of the pedantic side of grief, blunted but not extinguished by time, creates a very universally applicable mirror, a very democratic tool for any viewer to look into and see shadows of themselves and people they know. Other than a brief epilogue, the entire film takes place within 24 hours, with no overtly important events occurring within that span. The most definitive event relative to what we see is the death of the Yokoyama family’s oldest son, Shunpei 12 years prior. By temporally removing this observation of life from the event that defines it, and by temporally restricting us to one day’s interactions, the film forces us to focus on the nuances of the interactions of the living family members in order to find meaning or understanding in what we see. 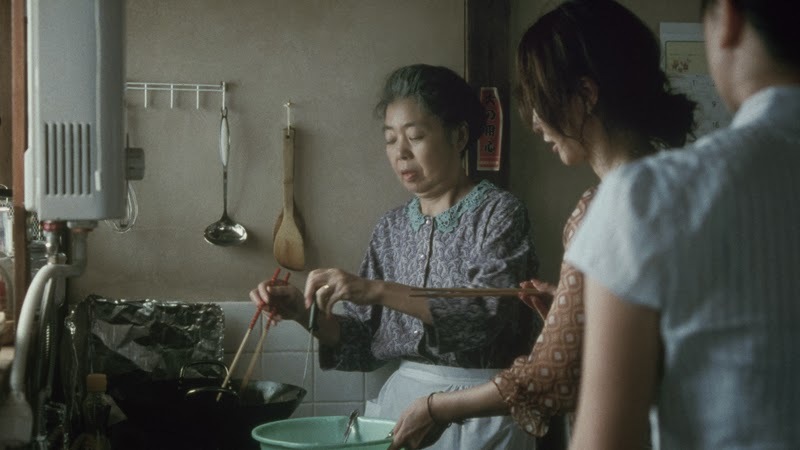 Interestingly, Koreeda includes the cinematically neglected demographic of the elderly, another element making this film more reflective of reality. Certainly the aging parents Kyohei,, the reluctantly retired doctor, and Toshiko, the powerhouse of domesticity, are the center of the relational dynamics in the film. Their quirks of old age are perpetually counterpointed by moments of unexpected passion or softness. Their grief at losing their son is still palpable, but their very lived-in home is visually filled with ghosts of all three of their children as well as their younger selves. The film embraces prosaic moments and never hurries them along. There is a distinct lack of editing-out or pacing. Many things are allowed to occur in real-time with a minimum of cuts or angles. We see people talking with their mouths full, and we listen to complete conversations that do not arrive directly at their destination, if they arrive at all. In this sense the film is very Brechtian in its purpose and its relationship with its audience. But it also embodies the preservation of life by a representation of life discussed by Bazin. Especially in the many prosaic details of Toshiko’s food preparation, the film captures a copy of real living, in a way even more immediate than a still photograph. Despite it’s inevitably subjective, constructed nature, the film attempts in earnest to look at a high-fidelity version of reality from the outside, establishing and revealing relationships through the observation of physical interactions within the frame. We begin to see how these people spend their time, how they choose to self-edit in different company, and what worries they carry around with them. Bazin said that true realism recognized the need to give a significant expression to the world both concretely and in its essence. So many of the minute, concrete details captured in this film accomplish both ends. They both serve as a near-perfect mimesis of the actual events that occurred in front of the camera, representative of a billion domestic chores accomplished quietly around the world, and they serve to capture the essence of the reality Koreeda is attempting to represent: the complex organic microcosm that is a home, filled with dynamic memories and complicated by countless previous interactions. The moments when that essence is most effectively captured are electrifying forays into the potential of realism. There is one very Renoir-esque shot when Ryota, Yukari, and Atsushi arrive at the Family home. The shot begins after we have seen Toshiko head to answer the door. In a long, deep focus, static shot we see her answer the door, see the bustle of everyone removing their shoes, and then eventually see everyone leave the frame to continue further into the house. The shot itself is remarkably like-life. If we, a viewer, were standing in that spot watching those events transpire we'd have a very parallel image to ingest. There is no expositional dialogue in this scene, but by viewing it in this less-altered way we are able to identify the nervous energy in the interactions, the nuances in the fronts put on by different individuals in front of certain others, and a terrific sense of the space this is all transpiring in. At one point Ryota, the surviving son complains, ""Normal," everyone keeps using that word." As much as anything singular, this may well represent the essence of the film. There is no attempt to draw out the extraordinary, or to create or resolve conflict in this film. It is largely an observation of “normal” that allows us to contemplate how loaded, complicated and fragile “normal” can be. Brecht talked of how realism changes the hunter into the quarry. Rather than hunting for a satisfactory catharsis, the viewer is invited to engage with this film as a quarry. To dig and sift and hold on to what resonates. This exploration of characters without an agenda of how the audience should judge or interpret them was especially evident in Kyohei and Toshiko. Their characters seemed to become more rich and complicated as scenes passed. Kyohei started off seeming rather broodish, but as he somewhat helplessly watches his neighbor taken away in an ambulance his sense of contradiction and fallibility is palpable. Toshiko seems initially to be a power-nurturer, but when she admits to wishing she had someone to hate for her son’s death, and to intentionally causing anguish for the awkward young man who was saved at the expense of her son’s life, she becomes remarkably human. She, and the entire Yokoyama family, become so very real. The film is about real life, real grief, real death, real aging, real disappointment, and real relationships.